Start saving money ASAP. London is expensive, and if you want to travel that’ll cost a pretty penny even if you book cheap airfare and a hostel. Figure out why you want to go to London. Besides studying abroad blah blah blah, are you going to London to party? Fine. Are you going to London to travel? Fine. Are you going to London to really get to know London? Fine. That’s all fine, but you need to decide sooner rather than later so you don’t waste any time once you get there. Start reading up on London. Look at maps, buy a London Frommer’s and start to make a list of things you want to do. It’s easy to get overwhelmed once you’re there with so many choices, so the more you know the better off you’ll be. Look into getting a Bank of America debit card if you don’t already have one. They have low international ATM fees and you can use any Barclay’s ATM without getting charged an astronomical amount. Check out different banks policies on international fees before you do anything; the more you can save on fees the better. Also check out a Travelex chip and pin card. Set up a Mint.com account if you don’t already have one. It’s free, and it hooks up with your online banking to tell you how much money you’re withdrawn and what you’ve spent where. The more you can keep track of your finances while you’re there, the better. Think about cell phones. Most US carriers offer a phone or two that can be used internationally but I’m pretty sure it can cost a lot to do that. If you have an iPod touch, iPhone or smart phone in general really, you can take the SIM out of your phone and use Wifi and take pictures and go online where there’s wifi. If you’re going to be traveling a lot and want to have a phone, I’d recommend the National Geographic phone I got to go to London. It was absolutely like traveling back in time as far as technology goes, but I could make calls from any country to the US or the UK since the phone was unlocked. Again, compare costs before you do anything. Buy a UK outlet adapter. You shouldn’t need more than two, and they’re not that expensive. And don’t bring a lot of things from the US (like hairdryers, hair straighteners, outlet strips etc) because there’s a strong possibility that you’ll totally fry it. If you really need something, use amazon.co.uk to buy it once you arrive. Figure out where to exchange some money before you leave the US. I went to an AAA office near my house since my parents have AAA. When you’re packing for your stay in the UK, pack light. One of my flatmates brought 80 pairs of underwear, four sets of sheets, four sets of towels and A LOT of clothes. It was so unnecessary and she ended up paying the overweight luggage fee on her way over. Pack 2-3 pairs of jeans, comfortable walking shoes, enough underwear and socks to last you three weeks, and clothes that are good for layering. I’d suggest packing in two medium sized suitcases rather than one really big suitcase. Two smaller ones are more manageable than a monstrosity of a suitcase that weighs 70 pounds. Don’t stress too much over rain boots; I only wore mine three or four times my entire trip. London gets a bad rep for being really rainy and miserable and I was pleasantly surprised by the amount of beautiful sunny days we had. Don’t forget an umbrella. Buy a nice compact one that you can carry with you as much as possible for those days when the weather changes drastically. Don’t forget your sunglasses either. Bring batteries. They’re the same everywhere and you never know. Get used to the exchange rate now. And once you get to London, always do the conversion in your head when you’re not sure if you want to buy something for price sake. If you wouldn’t pay the equivalent in dollars, it’s probably not worth it. Read up on the differences in American English and British English. You may embarrass yourself, otherwise. Prepare yourself for crossing the streets. Since they drive on the other side of the road (and the car), crossing the street is seriously confusing. They have directions telling you which way to look painted on the street, and you should always cross where it says to cross. Never jay walk. Not until you’re very used to the traffic patterns. Pedestrians DO NOT have the right of way and cars will absolutely not slow down when you’re in the road. It’s best to cross at a big of a jog if you’re not sure if it’s your turn. You want to live, after all. There is no such thing as sidewalk etiquette in London. At home, one side of the sidewalk is reserved for people going one way, and the other side of the sidewalk is reserved for people going the opposite way. In London, there’s no such thing. People walk wherever they damn well please and ‘excuse me’ isn’t a phrase in their vocabulary. The same goes for shopping in crowded stores. People just nudge their way past you if you’re in their way. Don’t get mad, just nudge someone out of your way and you’ll feel better. You must go to Primark. They have clothes for men, women and children and it’s all very trendy, fashionable and cheap. Just keep it in mind when that £10 jacket you bought rips that it was only £10. Avoid the mega busy store on Oxford Street and head on over to the Hammersmith Primark. It’s less crowded and less stress inducing. Never leave anything in your pockets. Ever. Absolutely nothing. Pick pockets are certainly on the prowl everywhere you go, and the more aware of this you are, the better. Don’t think, “It’ll never happen to me.” Assume it’s entirely possible and safeguard your belongings like there’s no tomorrow. Having your wallet, cell phone, iPod stolen etc. is awful. I know for guys it can be tough not to carry a wallet in your pockets, but if you are going to keep your wallet in your pocket, use your front pocket and try to leave the important stuff you won’t need at home. And never take your passport anywhere unless you have to. Skip packing the pepper spray/mace. It’s considered a firearm. Don’t be surprised by the serious amount of American culture that’s present in the UK. They play a lot of US TV shows and US music there. Expect it. Accept it. It can be disappointing, but that’s just how it is. 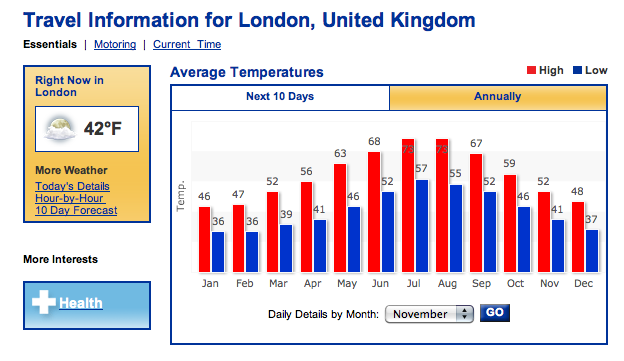 You might get sick while you’re in London. For example, I never get sick at home. Ever. Maybe the occasional cold every couple of years, but I never get sick. In London, I was on antibiotics twice in four months thanks to the different strains of sicknesses lurking about. Please go to the doctor when you get sick. It can be pricey (it cost me £40 each visit to the doctor) but I felt better right away, got a prescription, had the advice of a doctor and I wasn’t getting my entire flat sick. Don’t be afraid to go places by yourself. I spent almost my entire spring break exploring London by myself and it was so nice. Being with people 24/7 is nice, but it’s really nice getting to do whatever you want and not having to worry about anyone else. As they told us when we got there, there are no ‘bad neighborhoods’ in London that they recommend we don’t go to. Some are more edgy than others, but as long as you’re cautious about where you are and what you’re doing, you’ll be fine. Once you get to London, I’d recommend using Skype to make calls home. If your parents/friends/family/whoever aren’t home a lot when you can Skype (thanks to the five hour time difference) you can buy unlimited calls to any US number using Skype for $2.99 a month, and you can cancel it at any time. It’s definitely worth it. Don’t expect every streaming American website to work (like nbc.com, Netflix, or Hulu). A lot of them don’t, which can be frustrating, but you’ll live I think. Don’t buy DVDs while you’re abroad. They’re formatted differently and you won’t be able to use them in a US DVD player. You can probably play them on your computer though, so just think before you buy. Don’t assume that the weather in London is like the winter weather in Russia. It’s not that cold in winter. Most nights it doesn’t even get down to 32°. You can find this chart here. http://www.tfl.gov.uk/. This will be your best friend. Study the tube map a little bit. It’s very easy to read. A lot of the lines will be closed for maintenance on the weekends, but the lines overlap and go everywhere, so the closures aren’t usually a nuisance. Always check on TFL before you go anywhere though. Every day delays can screw up a tube ride if you don’t check before you leave the house. As far as dining out goes, it’s a totally different experience than in the US. At pubs, you order at the bar and they bring your food out to you. You have no waiter and you certainly don’t get free refills (unless you go to Nando’s). When you do go to an actual restaurant with waiters, tipping is optional since waiters here are paid hourly wages. And sometimes the tip is automatically included. You can ask to have it taken off if you’ve had really terrible service, but I doubt you’ll need to. Try new things! Try your best to be open minded when it comes to everything. Try Shepherd’s Pie at a pub. It’s freaking delicious and I’ve never had one as good in the US. Try a pint of cider. My favorite is Magner’s Pear cider but you can buy really cheap generic brand pear cider at Sainsbury’s (the local grocery store). Also- if you’re into fruity drinks, I recommend Fruli fruit beer. It’s hard to find (but they list locations on their website) and I know a lot of people who absolutely love it. Speaking of grocery stores, you’ll be frequenting them often if you plan on cooking/eating in. Preservatives aren’t used in the UK so things spoil quickly, meaning you’ll need to buy often to have fresh food. Jessica, did you travel outside of London/England? Is there anywhere you would recommend to take a trip to? I went to Glasgow and Paris and they were wonderful. I also had friends who went to Barcelona, Ireland, and Italy. I don’t think you can go wrong with travel in Europe. You’re so close to all of it and whatever strikes your fancy is within reach! There’s also something to be said for travelling around the UK as well. It really depends on what you’re interested in! Hello Jess Philo, It is very helpful and it had a great opportunity to take and to achieve our goal.also it make us self responsible and confidence to spend life when we go far and utilize our ideas . THANKYOU! i am going abroad in the spring and this was VERY helpful! Pingback: Useful links for planning to study abroad for any amount of time | I'm in London! This was super helpful! I’m leaving to study at Queen Mary Uni in London in three days, so I’m frantically reading up on All Things Study Abroad. :) Thanks so much for the advice! You’re welcome! I didn’t get this kind of break down before I left for London and I think it would’ve been really helpful. There’s so much to know you don’t know what you don’t know, you know? Let me know if you have any questions about anything and good luck! Hey samchaffin, how was your trip? I’m planning on studying at Queen Mary Uni next year!